I’m fine with cooked tomato products, like marinara or ketchup. But, raw tomatoes are disgusting. It’s one of the only foods that I just can not stand. That makes my relationship with salsa an interesting one. Obviously, I’m not a pico de gallo type gal. 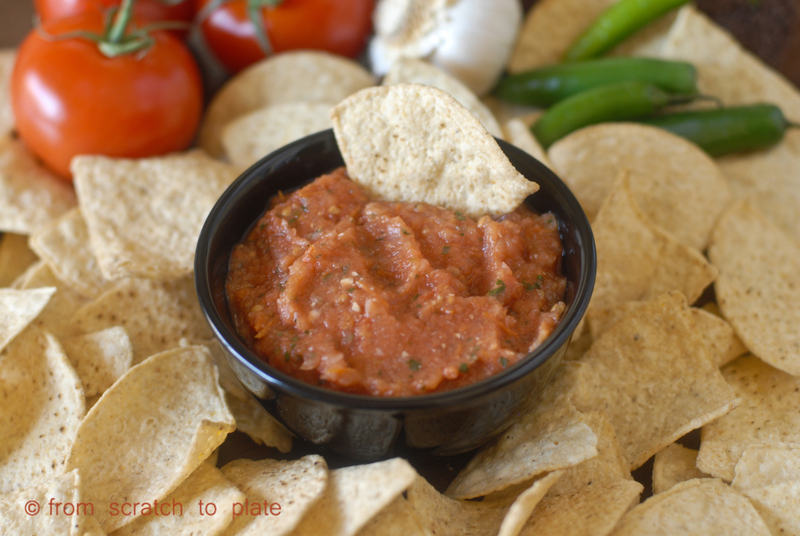 I prefer pureed salsas with no chunks, and I have always just dipped the chip and gotten the juice and flavor on my chip without actually scooping any salsa on there. Weird. I know. But then, I went to a Mexican food place called “Burger House”, believe it or not. I was skeptical about the quality of Mexican food there. It’s in a small town where my husband lived in his younger years. Everyone in his family swore by the food there (a Mexican place called “Burger House”? Really? )…and they were right! I craved it for weeks after we arrived back home. For the first time, ever, I poured the little cups of salsa over my burro before taking each bite. It was addictive. I analyzed the salsa as much as possible. Obviously it had tomatoes and cilantro, and chilis that gave it a nice kick, but I also noticed tiny pieces of char that made me believe that something on there was roasted. I was on a quest. I have tried various types of salsa, tons of recipes, and came up with a mediocre one that involved canned fire roasted tomatoes. Then, I happened upon a post on one particular kitchen one day: . I made it and almost came undone. It was amazing. It’s pretty darn close to the Burger House salsa, but so fresh tasting, with a good bite. I made a few simple changes to personalize it. When it comes to spice, homemade salsa is always unpredictable. Chilis vary in spiciness from chili to chili, so it’s always chancy. If you’re concerned about heat, start with two peppers. You can also use jalapenos, which are milder, but I prefer the flavor of serranos. 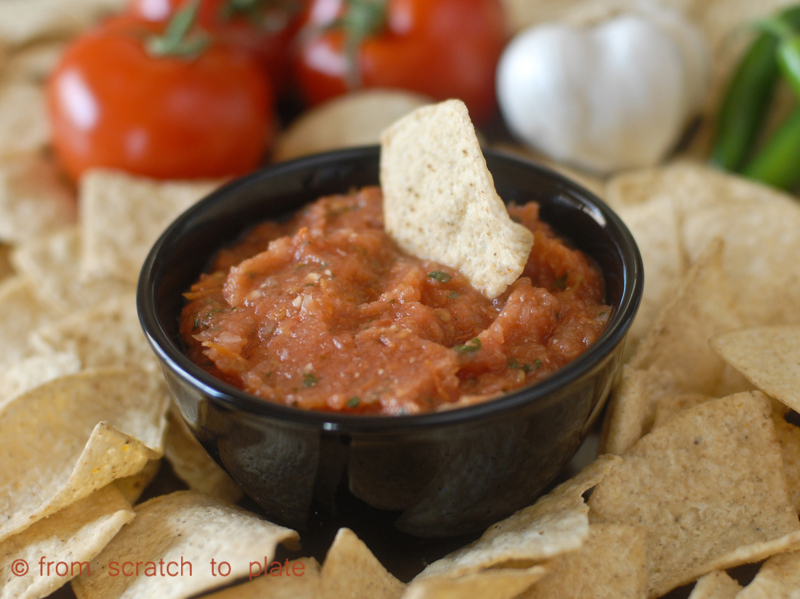 This recipe makes a lot of salsa and is amazing with home grown tomatoes. It also freezes perfectly. I typically make a huge batch, then freeze them in sandwich bags for future consumption. Make some this summer!! Start by preheating the oven to 375 degrees. Halve your tomatoes and onions. Leave the papery husk on the garlic cloves, but separate them into individual cloves. If you want more heat, you will leave the seeds and membranes in the chilis, so remove the caps from the chilis now. If you want less heat, you will remove the seeds later, so keep the caps on. Lay the tomatoes, onions, garlic and peppers on baking sheets. It’s a good idea to have the tomatoes on a baking sheets that has sides, as they will produce a lot of juice. Roast until the onions are translucent and the tomatoes and peppers are starting to char, about 45 minutes to an hour. You may have to remove the garlic and peppers before the tomatoes and onions. You may also have to rotate pans while cooking to allow each pan access to the heat source. Just check on them every so often until they are all soft and there’s some charring going on. Pull the pans out of the oven. Let it cool for 5 minutes. If you want to remove the seeds from the chilis, put on plastic gloves (trust me…I did this once without them and seriously regretted it). slice open the side of each chili. Use the cap to pull out the middle membrane with all of the seeds attached, and discard. You may also need to use your finger and wipe any residual seeds from the chili. Place the chilis in a food processor. For the garlic, you should be able to squeeze them, allowing the soft cooked middle to go into your food processor. Whatever method, you want to remove any charred husk and any outside layer that is to tough to puree. Place the tomatoes and onions (you’ll probably have to do two batches) in the food processor with the garlic and chilis. Add the juice from one lime, 1TBS salt, and the cilantro, and puree it all. After your two batches are done, combine it in a large bowl and taste it. Add more lime juice or salt according to your tastes. The flavors will intensify in the fridge. I find that this is the best after about a day in the fridge (and it gets spicier, keep that in mind).